A group of blind men heard that a strange animal, called an elephant, had been brought to the town, but none of them were aware of its shape and form. Out of curiosity, they said: "We must inspect and know it by touch, of which we are capable". So, they sought it out, and when they found it they groped about it. In the case of the first person, whose hand landed on the trunk, said: "This being is like a thick snake". For another one whose hand reached its ear, it seemed like a kind of fan. As for another person, whose hand was upon its leg, said, the elephant is a pillar like a tree-trunk. 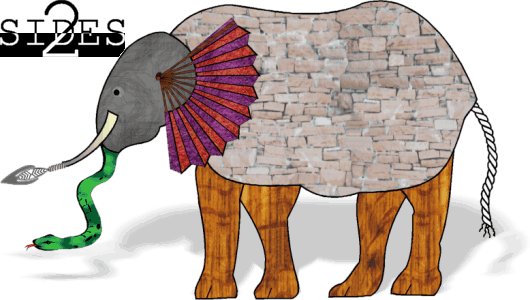 The blind man who placed his hand upon its side said, "elephant is a wall". Another who felt its tail described it as a rope. The last felt its tusk, stating the elephant is that which is hard, smooth and like a spear. The blind men then discover their disagreements, suspect the others to be not telling the truth and come to blows. Post-truth and fake news have become the catchphrases of the very divided world we all live in. Caught up in filter bubbles of personalized recommendations and click-baits, we fail to perceive the colours in which the world is painted for others. Hence we paint it black. Left or right, liberal or conservative, polytheist, monotheist or atheist, elitist or aam aadmi; we all have become defined by our narrow domestic walls. And when neither black nor white is the wrong answer, where is the right answer? When every story has two sides, which is the absolute truth? 2Sides is an attempt to bring the world a little bit closer. Our aim is to bring to you the latest and the most breaking news - from both sides of the fence. Knowing the concerns, arguments and perspectives of others, we hope, will help foster understanding, and understanding will help foster empathy. We do not claim to have the answers or the absolute truth, we merely seek to show you both sides of the coin. There may be many interpretations for the same story, but together, we just might be able to glimpse the actual elephant.